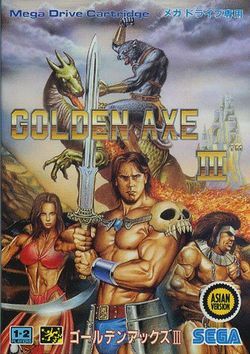 Golden Axe III is the last game in the Golden Axe series before the radical changes of Golden Axe: The Duel, and the speedy end of the series shortly after. It draws much of its inspiration from Golden Axe: The Revenge of Death Adder, but has thrown out some of Golden Axe II's improvements in the process. The controls are more responsive than ever, and there are far more moves than in any previous game. The storyline centers around a new villain known as Damud Hellbringer (or the Prince of Darkness) who has possessed the four heroes capable of saving Yuria. Gilius Thunderhead frees the players' heroes from this enslavement and sends them to take down Hellbringer. Just like The Revenge of Death Adder, Gilius is not playable in this game. The game never saw a U.S. release in cartridge form, and despite later being available to the Sega Channel's limited subscriber base many players and at least one magazine decided that the cancellation was due to it not being worth porting. It has since appeared on GameTap, but only for U.S. and Canada players; its appearance in the Sega Genesis Collection in 2006 marks the first time the game has been widely available outside of Japan. The Japanese version is entirely in English (although the manual is still in Japanese), making importing easy.